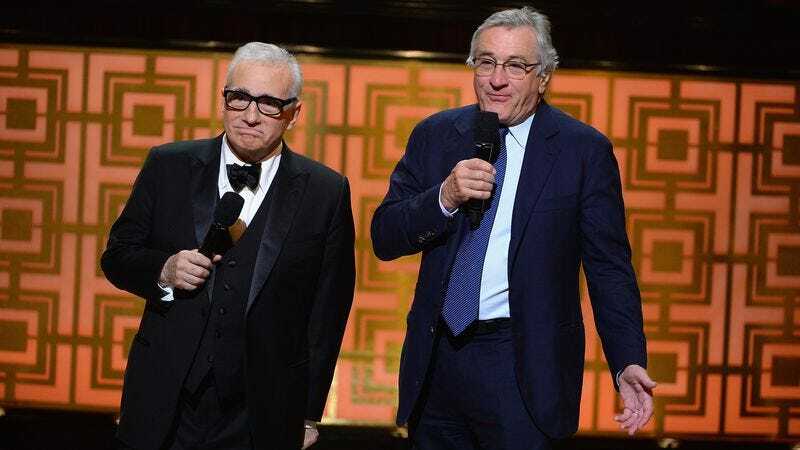 Variety reports that Netflix has acquired the rights to The Irishman, the latest collaboration between long-time friends Martin Scorsese and Robert De Niro. Originally announced way back in 2010, the film is expected to start shooting later this year, and will be the ninth shared project between De Niro and his Raging Bull director. Based on Charles Brandt’s I Heard You Paint Houses, the film would cast De Niro as Frank Sheeran, the alleged contract killer who supposedly murdered labor leader Jimmy Hoffa. Back when it was originally announced, the cast list for The Irishman read like a greatest hits of gangster movie stars, with Al Pacino and Joe Pesci both attached to co-star alongside De Niro. It’s not clear whether those deals are still in place seven years later, or if De Niro and Scorsese will be making their way to Netflix on their own.